I have a new experiment in mind. I’d really love to get a group of women to harvest their menstruation. This was originally a visual idea: Alexandra and I are contributing to the Feminist Materialisms conference with a ‘material conversation’ and I was thinking about how matter could become the starting point of an embodied narrative. I was picturing this table with lots of blood filled jam jars that I would take out one after the other while telling the story of the menstruator who had donated the blood, their experiences with harvesting a liquid that is normally disposed of. When I lived in Warsaw I had a friend who had started using the DivaCup and it had, in her words, totally changed her life. I very clearly remember her telling me: “so I took it out and you’re supposed to just flush the blood, but I couldn’t do it. I was just fascinated with this liquid, ’cause it was part of me and so precious. So I started watering my plants with it.” Supposedly menstrual blood is full of nutrients. One of her friends painted with her period. Basically, engaging with her body through the DivaCup technology completely changed the way she felt about her menstruating body and her abject body fluids. So I’ve been wondering if this could be set up as an experiment. 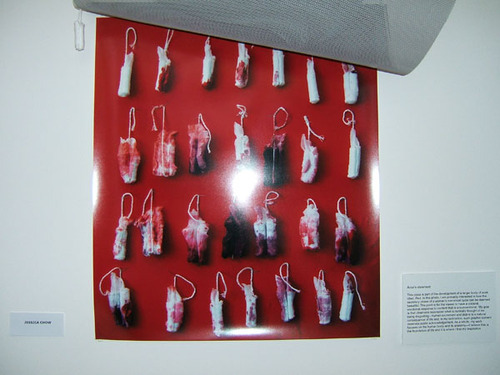 I want to get a small-ish group of women to harvest their blood and document the process. I like the manual, embodied form of hand writing, which would also be aesthetically valuable if I were ever to install the stories. So my first experiment will be to harvest my own blood, just to see how it acts. There are practical-material concerns: how do i store it? How much of a hassle is it to collect your menstrual blood? Does it stay liquid or does it dry out? I’ll be posting about this shortly but am excited to announce the buy of my first MoonCup (the lady at Wholefoods even said she loved it. We had a whole chat about using the cup. I swear, there’s no stopping the menses-talk). Stay tuned for more.